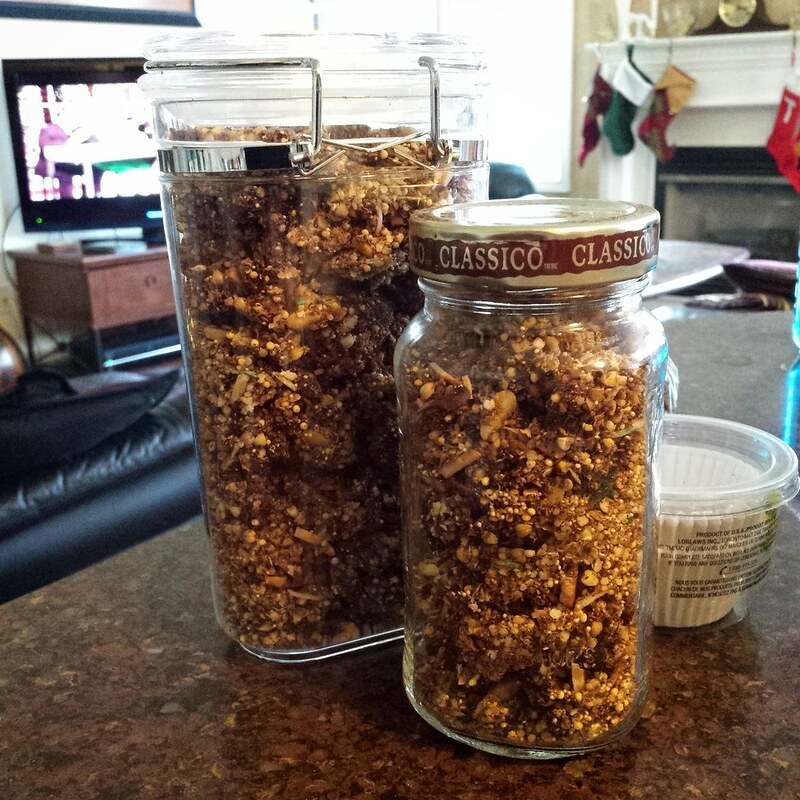 "Date Square" Granola | What Smells So Good? Now that report cards are done and filed (two major computer glitches later! ), I've been able to come back to the kitchen and blog and catch up on all my holiday must-do recipes! Like every year, the majority of my gift recipients will be getting boxes of assorted homemade goodies - from preserves and salsas to cookies, biscotti, chocolates and of course, granola! This year, I found myself with an unbelievable amount of dried dates after cleaning out my pantry, and was immediately inspired to make a granola with the flavours of one of my favourite desserts - the date square. My grandma used to make buttery, oaty, coconutty date crumble bars filled with a thick, squidgy layer of orange infused fruit paste at least once a year, and the smell of the paste baking in this mixture of gluten free grains, coconut and almonds brought me back to my 8 year old self. Not satisfied with simply using pureed dates, I added a glug of date "molassses" (also called silan) for a little extra caramelly oomph. Coconut and almonds added just the right amount of extra "yum" and crunch, making it perfect for breakfast or dessert. I decided to go the gluten free route with quinoa flakes, buckwheat, millet, amaranth and teff so that I could give away assorted jars of granola to everyone on my list - not to mention using all those pseudograins added a good dose of fibre and protein to the mix as well! Heat the oven to 300F (or 275F convection, which I recommend) and line a large baking sheet with parchment. Combine all the “wet” ingredients and seasonings (date paste through salt) in a large pot and heat over medium-low, stirring, until coconut oil and almond butter are melted and mixture is smooth. Remove from heat and add the remaining, “dry” ingredients, stirring well. spread evenly onto the baking sheet and bake 1 hour, stirring every 20 minutes or so, until browned and lightly crisp. Turn off the oven and cool inside for 30 minutes, then scrape into a clean bowl and cool completely.